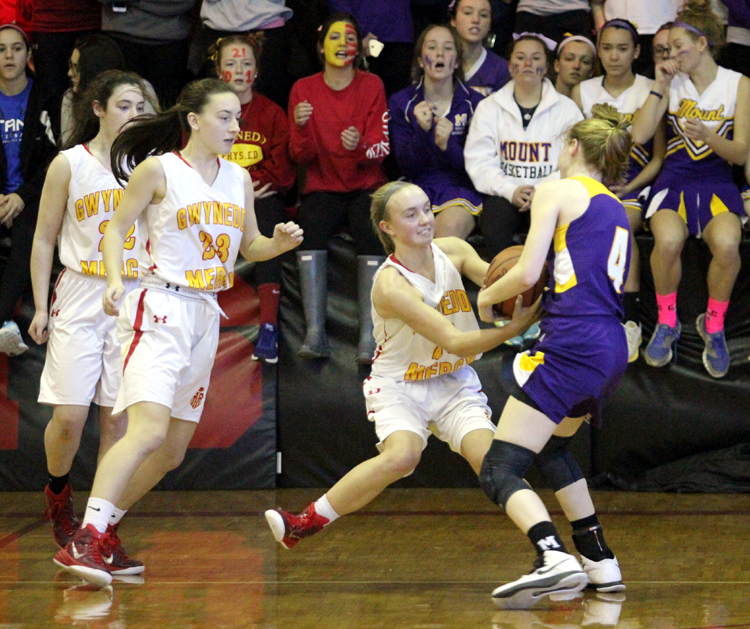 Tough defense helped lead to Gwynedd Mercy Academy's 32-26 win over rival Mount St. Joseph's Academy Jan. 31. As players jumped off the bench and raced to center court to celebrate with the five starters, the red-and-gold-clad gymnasium seemed to almost shake with delight. Behind them, the scoreboard told the tale. Gwynedd Mercy Academy had just defeated Mount St. Joseph’s Academy, 32-26, in a riveting Catholic Academies League tilt on Jan. 31 that helped explain why basketball coaches demand that their players work tirelessly and unselfishly when playing defense. Minutes later, GMA 14-year athletic director Terri Fasano and GMA’s principal, Sister of Mercy Patricia Flynn, walked toward each other, both sporting bright, wide smiles. When they met, they immediately embraced. The reason? This was the first time GMA had defeated its nemesis in basketball since 2002. Indeed, some wins feel better than others. “This was a very emotional win for so many here at GMA, as evidenced by former players in attendance,” said Fasano. “We have had some close games (against Mount) in those years but we just couldn’t get it done. Not this time. With junior guard Brigit Coleman scoring a game-high 10 points, freshman Carly Heineman tallying seven, junior Erica DeCandido adding six, junior Maggie Cameron chipping in five, and freshman point-guard sensation Maura Conroy contributing four points and brilliant ball-handling, the Monarchs seized an early lead, increased it to double digits by the third quarter, and utlimately would not allow the Royals to inch any closer than five points. Tenacious defense was the main reason. Lonergan was asked about a somewhat interesting observation. It appeared as though the GMA starters were obviously thrilled with a victory that placed them in a first-place tie with Mount in the very competitive Catholic Academies League, but they didn’t quite seem all that surprised, either. In other words, while some might have viewed the triumph as an upset, the Monarch players did not. In many ways, the Monarchs’ victory over Mount symbolized a GMA overall emergence in athletic excellence. This past fall, the Monarchs captured the league championship in both tennis and cross-country, and finished runner-up in field hockey, soccer, and golf. All six of GMA’s sports teams appeared in the PIAA District 1 Class AA tournament, with both tennis and golf nabbing district titles while cross country, field hockey, and soccer placed second. In the state tourney, the tennis team reached the semifinals, field hockey was eliminated in the quarterfinals, five players qualified in golf, and sophomore Stephanie Szekely placed 80th out of more than 300 cross country runners. Individually, senior Nicole Catalino has committed to play field hockey at Division I Princeton; classmate Corinne Persichetti will do the same at Division I Fairfield. Junior field hockey stalwarts Ava Rosati and Megan DuVernois have already made verbal commitments to attend Penn and North Carolina, respectively. “So many times you hear athletes say they ‘want to win,’ but when you ask in return, ‘What are you prepared to do for that want?’ the answers are sometimes hard to find. Among those who appreciate GMA’s approach are star athletes Natalie Danze and Allie Szekely. Danze, a senior, finished as GMA’s all-time leading winner in tennis, and Szekely, a junior, has literally dominated the local swimming competition in record-setting fashion. Fasano, a 1980 Bishop McDevitt graduate, was a member of the Lancers team that defeated Archbishop Carroll for the 1979-80 Catholic League title. Among Fasano’s possessions is a piece of mesh that was snipped off during the traditional net-cutting ceremony. Perhaps that helps explain why Fasano truly comprehends the scope of accomplishments such as GMA’s basketball win over Mount. Apparently, there’s a lot more being learned at Gwynedd Mercy Academy than just how to play sterling basketball.